Amanda Anderson is a West Midlands based mosaic maker who originally studied Fine Art (sculpture) at Liverpool’s John Moores University. 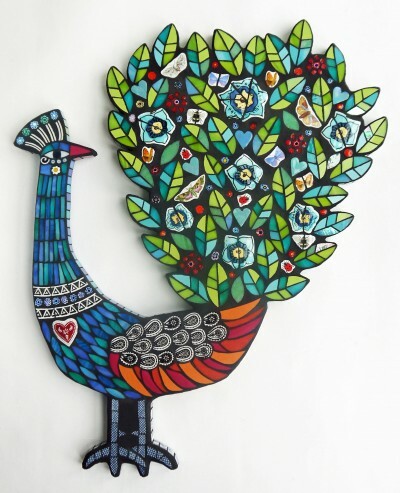 Amanda’s mosaic menagerie of birds and other creatures are hand made using stained glass in a kaleidoscope of colours, jewel-like millefiori and patterned ceramic pieces intricately cut and constructed. She finishes her mosaics with a dark charcoal grout to give them a deep rich and seductive quality. Among her influences are the vibrant textiles and embroidery of India and Mexico, as well as a love of natural history, kinetic sculpture and vintage mechanical birds. All her mosaics are wall-based interior pieces.